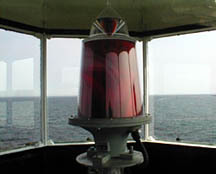 Active aid to navigation; the lighthouse tower is owned by the U.S. Coast Guard. Accessibility: The lighthouse is on a U.S. Navy base and is not open to the public, but you can drive to the entrance of the Navy installation for a good view. From Route 1, take Route 195 South for about five miles to Prospect Harbor. Turn left onto Main Street. After a very short distance, turn right onto Corea Road. Where the road bears left toward Corea, drive straight onto Lighthouse Point Road. Follow to the gate of the Navy installation. There are no real parking spaces; pull to the side of the road. Good views of the lighthouse are possible from the rocky beach, especially at low tide.